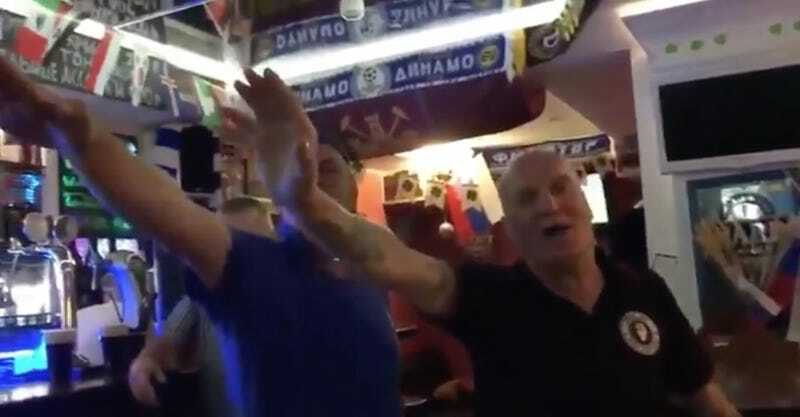 According to The Telegraph and journalist Bryan MacDonald, these English fans went to a pub in Stalingrad after Monday’s England-Tunisia World Cup match and celebrated England’s win by doing anti-Semitic chants. This particular chant is one that is often used by fans who do not like Tottenham Hotspur, an English Premier League team that has historically been associated with Jewish fans. There’s a whole complicated history here, involving Tottenham fans sometimes referring to themselves as the “yid army” and Tottenham haters responding by singing songs about Hitler and ovens. But you don’t need a history lesson to know that the guys in the video above are gross assholes, and should be shamed.